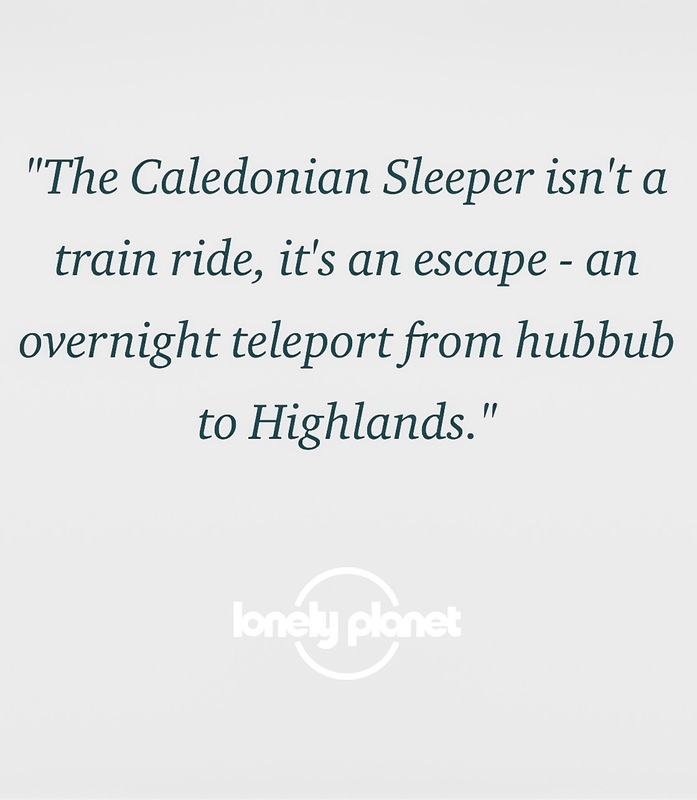 Travelling overnight between Scotland and London on the Caledonian Sleeper, is often touted as a travel must do. It’s not the fastest nor even cheapest way to get to Scotland from London, but it’s certainly the most exciting. Boarding the train in London Euston, at around 11pm, then after a quick night cap in the lounge, its time to retire to your cabin, before waking up to a view of the Highlands whizzing past your window. Check out my onboard experience below. 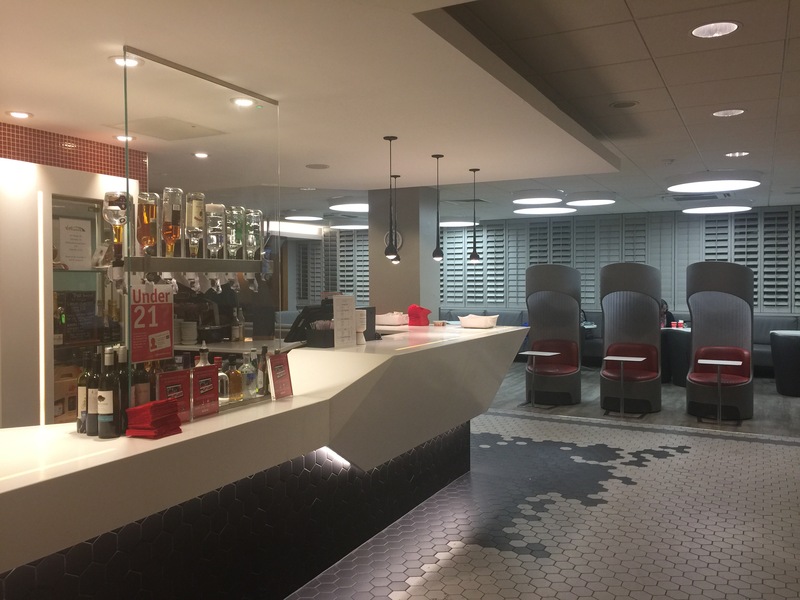 Upon arriving at Euston station I headed for the Virgin 1st class Lounge, and before you start getting excited , it’s nothing like Virgins airport lounge, but it is away from the hustle and bustle of the main station. The lounge serves a limited range of free refreshments, ( tea ,coffee & soft drinks ) and snacks ( crisps , biscuits & fruit ). There is alcohol available, but it’s chargeable, there are comfortable seats , plug sockets and quiet work spaces so it’s definately worth stopping by. 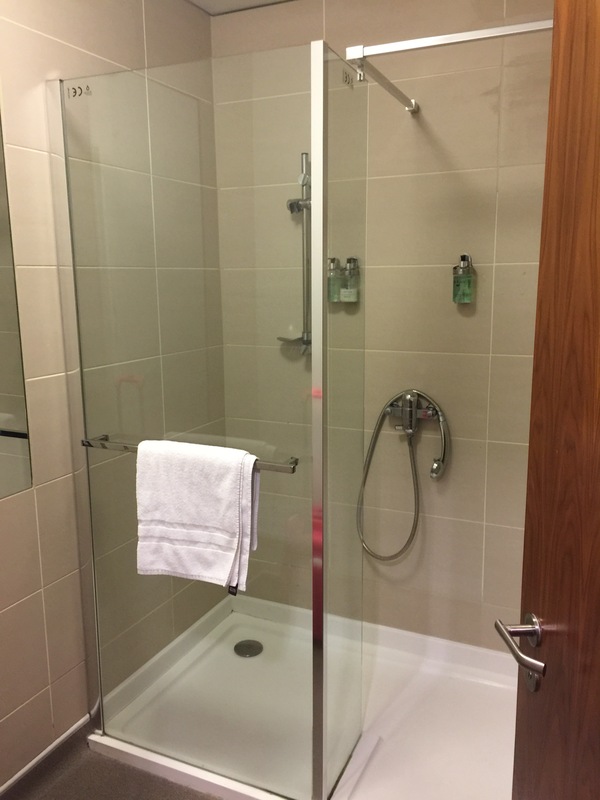 This best thing about access to the Euston station lounge , is that theres a decent shower to use, ( there are no showers on the Sleeper ) so you can get a hot shower on arrival, before you head off to start your day. If your travelling first class its free, including towels and shower gels etc. If your on a standard ticket, you can still have access to the showers for £5.00, you just need to buy a voucher from the on train host. 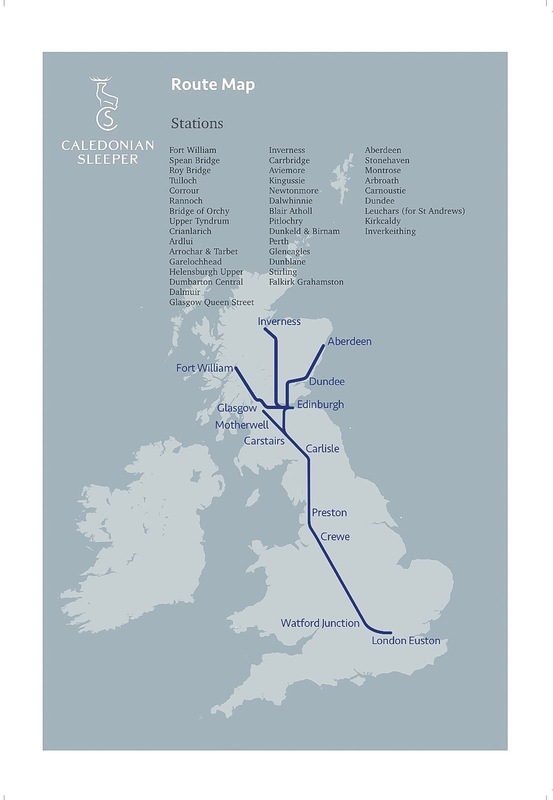 The Sleeper runs 6 nights a week , Sunday to Friday in both directions. Boarding starts at 11pm and the train leaves Euston promptly at 11.50pm. Before turning in for the night, theres just time to visit the onboard lounge for a night cap, or a traditional Scottish supper of a plate of haggis, neeps and tatties. Then is back to your extremely snug cabin, check out my in room vlog below. There are no plugs in the cabin, but there are 3 newly added USB sockets, oddly located above the sink area, if you want to use your phone / laptop while charging, a 2 meter lead just about reaches the bed. The bed was comfortable, and I managed to get a decent nights sleep, but I personally found them extremely narrow, and there was certainly no room for tossing & turning. As previously mentioned there are no showers on the train ( the whole service is due an major overhaul in 2018 which will include ensuite showers ) . There are a couple of toilets at the end of each carriage and a wash basin in each cabin. 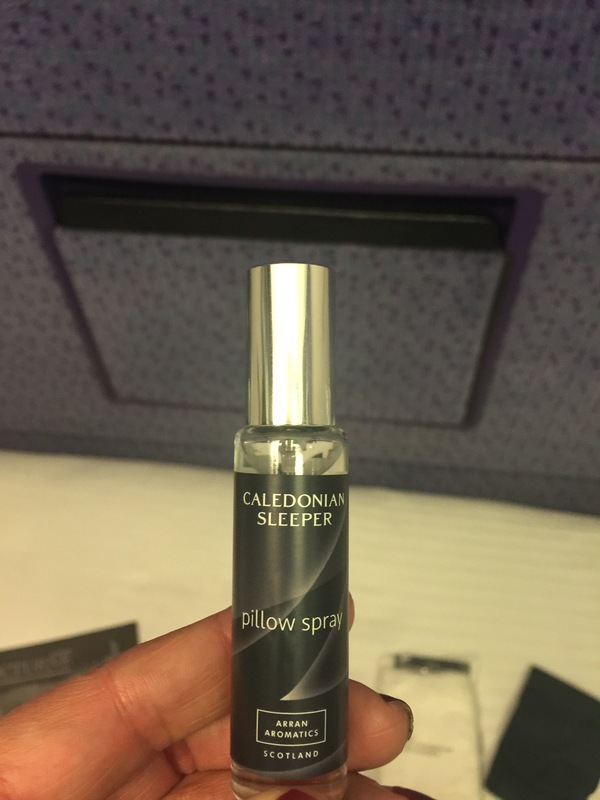 The cabin comes with bottled water, and a cute sleep kit from Scottish company Arran Aromatics, body wash & lotion, an eye mask , flannel , ear plugs , socks and a pretty nice smelling pillow spray to help you drift off into the land of Nod. If your getting off in the Lowlands, ie Edinburgh / Glasgow the train pulls in at approx 7 am, I was disappointed that due to leaving late and arriving early there is no view from the window, as your travelling in darkness. So its worth noting if your taking the train for the view, you wont see it on this train, you’d have to travel further up to the highlands i.e. Inverness , Aberdeen & Fort William, where ive been told you’ll be able able to take in the amazing mountain views over breakfast. 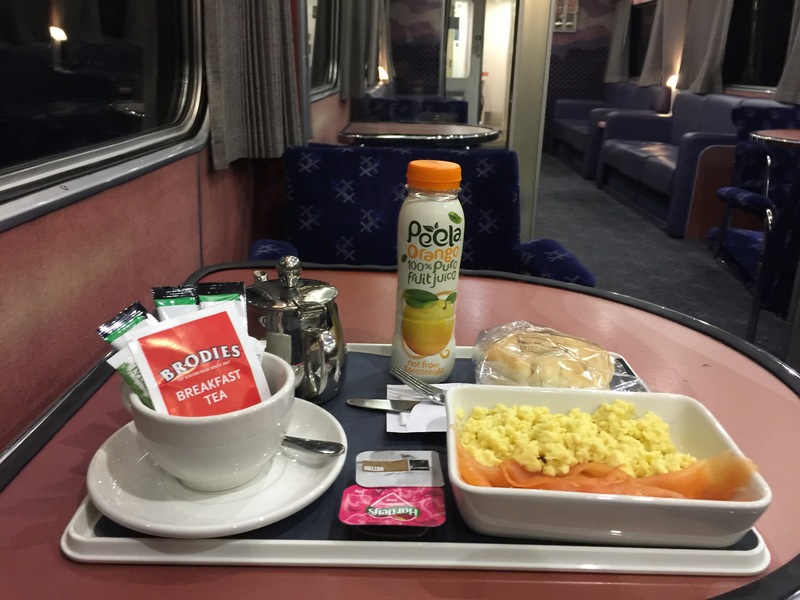 I was given a prearranged knock on my cabin door at 6.30am and headed down to the lounge for my breakfast , A hot breakfast is included in the price of your first class ticket , you can choose from porridge , salmon and eggs or a traditional Scottish breakfast. You can also take it in your cabin if you wish. Unfortunately there are no on station shower facilities in Glasgow , so its worth enquiring with your hotel if you can check in early, so you can take a shower when you get off the train. As already noted this is not the fastest nor cheapest way to travel to Scotland , but you do save the cost of a hotel room. And it really is a great experience. Whilst i did the return journey between London and Glasgow , I probably would advise, if you just want to do it to tick it off the bucket list, one way is enough. 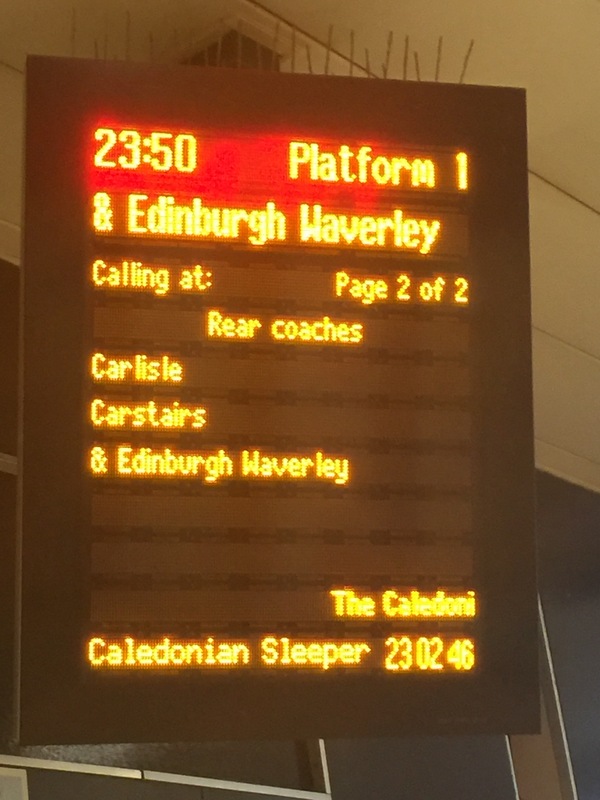 Please note that Serco the current operator of the Caledonian Sleeper kindly hosted my journey in order for me to write this review, but as usual opinions are all mine. Maybe some good views if you do the trip in summer? Sun can rise around 4:30am, I think. And as you say, plenty of views if you go on into the Highlands. Yes I travelled in October rookie error 😳 I’m going to wait for the upgrade in 2018 and take it up to the highlands , the cabins are going to be all ensuite, so it will be total rail luxury. Recommend it especially if heading to London for a meeting. Worth saying though that the CS is nownrun by SERCO not Scotrail. It was certainly worth doing it once, just sad I got no view at all , but can’t wait to see what they do with the upgrade ! !